I originally posted about this program in General Discussions, as it is not actually a plugin. But since then I have learned that most tools are discussed in the Plugins forum, so I follow suit. Just so you won't have to go back and look for the old thread, I shall re-introduce ProfilerMissing here. ProfilerMissing is your one stop tool to find what is missing in your profiles. Like many of my programs it operates on an exported XML file. You load that file and ProfilerMissing will show you everything that is missing. New in the latest version of ProfilerMissing is that boxset parents are only checked for data that is relevant for a boxset parent. The program now also comes with a help file. I suggest you do give it a look. Version 1.11.1 can be downloaded here. I briefly checked this out and it appears to be a valuable tool. You have my sincerest appreciation and thanks! I heeded your advice regarding the need for an exported XML file. Also, the Help file appears to be an outline devoid of data. I was sadly mistaken in the belief that most of my profiles were complete. I suspect that the best way to handle the deficiencies are to choose a Tab, make as many corrections as possible, export the collection anew, and then move to another Tab. If I can be of any help please ask and I'll do what I can to oblige. And thanks again. If you copy a downloaded help file to a drive other than C: you need to unblock it. Right click, select Properties and unblock should be right at the bottom of that window. I have now done what I should have done from the start. I have added a readme file that explains about the help file. I learned about this quite a long time ago, so I tend to forget that it's not common knowledge. You would think that Microsoft could have come up with a way to warn users that the file is blocked, rather than just to hide part of the content. Thanks for the confusion, Microsoft. I just realized that the icon that I had selected didn't show very well as a desktop shortcut if you have a dark background. Embarrasing that I hadn't noticed that before. I have also - finally - decide to offer my programs with installer (rather that just a zip file) for those who prefer that. ProfilerMissing will be the first, the rest will follow in time. So you can now get version 1.11.2 either as a zip file or as an installer exe file here. - A setting that lets you specify Summary as the default tab when a file is opened. 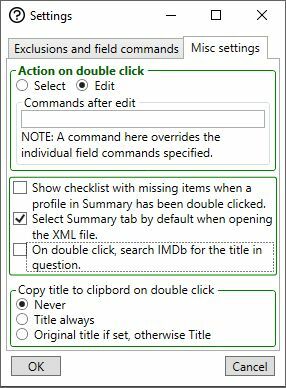 - A setting that lets you enable/disable the popup checklist that appears when you double click a title in the Summary tab. - Redesigned that popup checklist to make it more visible. - Redesigned the Settings window. You can specify that you want to search IMDb when you double click a title. This will use Original Title if available, otherwise Title. You can specify that you want the title copied to the clipboard. This may be useful if you want to use some other program or webpage to search for data on the title. 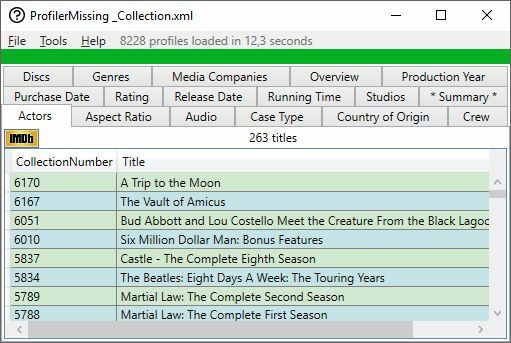 - Searching IMDb on double-click (see 1.13.0 above) was supposed to do so in addition to searching DVD Profiler. That didn't always work as intended, but that is hopefully fixed now. - When the opened file was changed (by re-exporting) the program asked if you wanted to reload the file, but clicking yes only made the prompt reappear over and over. Fixed.